If you have a set rig of electric keyboards, including a mixer and outboard effects, it is important to establish a permanent grounding scheme. With a permanent grounding scheme for all your electrical connections it can be very simple to over come grounding problems both on stage and in the studio. The first step is to plug all your gear into one large multi-outlet box. Make sure this box has the third pin ( ground ) connected from all the outlets to its plug. There are a number of manufacturers who supply 10 outlet boxes. If one is not enough, get a few. Next, plug all of them into one one main a/c extension box. A heavy duty 20 amp rated quad box 20 foot extension is perfect. Check the ratings of your gear. In most cases the total amperage of all your keyboards, mixer, effects and power amp won't exceed 15 amps. This box can be extended when a longer run is needed. On many stages the a/c hookup is usually quite far, so keep an extension handy. Next, hook up your stage monitor amps, mixer and effects. With no keyboards connected raise the master fader on your console. At this point if you hear any A/C ground hum or buzz, try unplugging the different components until you find where the buzz or hum is emanating from. If a piece of gear is humming check that its audio cables are good by swapping with known working cables. If that doesn't cure it, try a third pin A/C ground lift adapter. They are rather inexpensive. To be prepared for any situation you should have plenty on hand. Next, plug your keyboards into your mixer one by one. If you notice any noise try additional third pin A/C ground lift plugs on the keyboards that have problems. Once you have gotten all your gear hooked up, notate where in the chain you had to use any ground lifters for future reference. If you experience any grounding problems in a new environment, it should now be a simple matter of lifting the third pin of your master A/C extension cord. Your microprocessor keyboards will be a lot happier by using a spike and surge protection filter on their A/C lines. Older analog synths will also stay in tune longer with clean filtered and voltage regulated A/C lines. Although A/C voltage regulators are expensive ( around a couple of hundred dollars ) they will safe guard against your gear breaking down as often too. In large arenas the is no filtering and usually the A/C lines are full of voltage surges and spikes. Many of these filters reduce 60 cycle hum too. Most computer stores sell a wide variety of filters ( from $30.00 and up ). Check and see what amount of amperage the keyboards you are using draw and then buy an appropriate model. Most of your keyboards audio outputs probably terminate in 1/4" phone jacks. If you have keyboards that have balanced cannon XLR connectors use them instead. I must admit 1/4" phone plugs are convenient but they are unbalanced and will definitely add noise to your system in lengths over 15 feet. In some cases, if your unbalanced lines are near A/C cords, they will pick up 60 cycle hum. To eliminate this use balanced lines when ever possible. The direct box was invented for just this purpose. If you are going to use a direct box, use a really short 1/4" unbalanced cable between your instrument. As direct boxes are expensive ( $30.00 to $150.00 ) make the best of them by using short input cables. With a direct box you can extend the audio cables or your keyboards around 50 feet. In some cases even longer lengths if you're using active rather than passive direct boxes. Passive direct boxes have nothing more than a transformer inside. The frequency response of an active direct box far surpasses most passive D.I. boxes by a wide margin. Most active boxes are phanthom powered ( 48 volts dc ). Most consoles have phanthom powering built in just for this purpose. If your console doesn't have phanthom power built in, don't worry! There are a number of active direct boxes that have 9 volt transistor battery options for this very purpose. Be careful at this point! Almost all direct boxes have A/C ground lift switches that lift the "Ground" ( pin 1 ) in a balanced cable from its own output. This was meant to compensate for the third pin A/C lifter adapters. When your system is all working make sure you take note of the correct position of each D.I. boxes ground lift switch. If you are using any volume pedals, they must be plugged in before the D.I. box. To my knowledge there are no balanced volume pedals available. Once again I stress keeping the unbalanced cables to and from your volume pedal as short as possible. There are also passive and active pedals. Again the active ones will be quieter and have circuitry to keep your signal at unity gain ( at full volume - no signal loss ). If your active pedals need A/C be sure to figure out the pedals grounding scheme too! Your mixer is the one piece of gear that actually adds more noise than anything else. It multiplies the signals you feed it many times over to be able to drive a power amplifier. In many cases too, it has to pad ( attenuate ) down many of your keyboards signals. Many keyboards and synthesizers are capable of putting out a hot signal called "line" level. Many direct boxes put out a low level signal called "mic" level. Being that a board has to balance out line and mic level instruments, all that cutting and boosting adds noise. Make sure that the volume on all your mic level instruments are turned up high. LOw levels will have to be amplified greatly causing noise to be added. Watch out that your line level instruments are padded down enough. Insufficient padding will result in distortion. 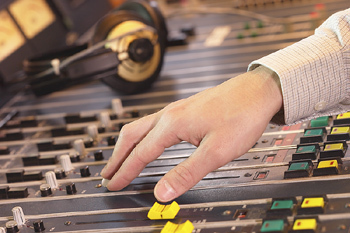 Another mistake is placing your mixer too close to your power amps or near A/C outlet boxes. You can pick up an incredible amount of 60 cycle hum from amps and A/C lines. The bigger the amp, the bigger its power transformer and the bigger the hum. Try to keep your power amps in a separate rack away from your mixer. Out board effects generally produce little hum, but experiment and if your outboard causes any hum, move it! Again if your mixer has balanced outputs, use them. Using unbalanced cables between your mixer and your power amp are another cause of noise. If you are using any equalizers between your mixer and power amps, the same holds true. Even though the next suggestion will not reduce noise or hum it will improve your sound. Never use an instrument's audio cable to connect your speakers to your amp ! Guitar cords were not designed for this purpose. Get some zip cord and make your own or have them made for you. If you invest in heavier guages of wire your speakers will sound even better. Try not to have long wire run from your amp to your speakers. This will insure a better sound by improving what is called the "damping factor" of your speaker response. Watch out not to let the ground of your amplifier's speaker outputs make contact with your audio ground. This can cause a tremendous ground loop that could possibly cause harm to you and your components. Avoid using the less expensive guitar cables. You know, the type with the molded plastic plugs. The molded plugs work fine in the beginning but in a short while will definitely become intermittent. The type of cables that you should use should are made with Beldon wire. Beldon and other similar manufacturers cable is generally rated low loss capacitance, which means less noise. It is shielded better to reject RF ( radio interference ) and other causes of noise such as 60 cycle hum. You can always tell if its Beldon because the name is printed on the cable every 18 inches or so. Check to see if the phone jacks are strain reliefed. This will prevent the cable from breaking at inopportune moments during your performance. Brass 1/4" phone plugs are great, but beware! They tarnish like all brass products and need to be cleaned on a regular basis. Fine emery cloth or "Polysand" will do the trick. Keep all your cables away from moisture, especially coca cola ! 7. Watch that shock ! ....... Guitar players know all too well what a wrong ground polarity shock feels like. You won't be feeling too fine if by accident your hands are touching the metal casing of one of your keyboards and the microphone with your lips on stage. Buy a small A/C outlet tester. The kind that has two probes for inserting in A/C wall outlets. Touch one end to the metal jacks of the audio outputs of your keyboards to the metal casing of your microphone. If you see any indication of the test light lighting then there is a polarity problem. Try reversing your master A/C extension cord with the aid of a third prong lifter adapter. In summing up, the above tips should quiet down your gear. The one thing I can't stress enough is the importance of having spare A/C outlet boxes, third prong adapters and audio cables to repair and modify any emergency situation.